Be open about what's real: feelings, experiences, how decisions get made, finances, and more. Transparency arises from a belief that the free flow of information and taking action in direct and honest ways best serves group needs. 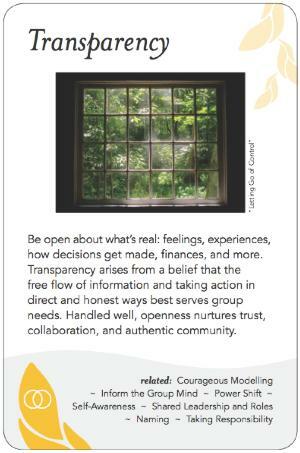 Handled well, openness nurtures trust, collaboration, and authentic community. To the extent that we can be open with each other about our feelings, desires, concerns and experiences, we build trust and get closer to fulfilling our purpose. Openness about power, organizational structure, and finances puts everyone on the same page. How a group is structured at the beginning influences dynamics around being open. It's easier to build in Transparency from the start than to change the culture later. Part of this is what gets talked about, and when and by who--do conversations take place in the full group or in small groups, during scheduled time or outside of official sessions? Another part of it is about the group's ongoing arrangements, like whether access to minutes and financial information is open or restricted. Transparency can only take place where trust is present, and the sharing of information builds trust. If a group is not feeling safe to be fully Transparent due to submerged conflicts, power differences, or other factors, you may need to be careful or slow about how this pattern is brought in. For example, formats that offer a degree of anonymity provide some buffering for people who may be justifiably scared of the consequences of speaking out. Transparency can create a safe space for truth-telling, and can acknowledge when it isn't safe to tell the whole truth. It can be encouraged through exercises that encourage candour. Facilitators can also work before the event or behind the scenes to identify situations where people are suppressing what they know or feel and 'surfacing' them, perhaps anonymously. Facilitators are well positioned to model transparency for the groups they are working with, and their behavior helps set a tone for the group. As John Foster says, "It's more functional to share when you are stuck or don't know than it is to pretend you do"--you can always ask the group for next steps. Or if you do know what to do, you might say, "At this point, I am choosing between xyz and abc, and evaluating it based on efg." Modeling transparency also supports the education of emerging facilitators, as well as assisting in averting the potential for misinterpretations of a facilitator's intent. FUTURE EDIT: Bring in IAP2's ladder of participation as a tool. Transparency needs to be handled with care. Done poorly, sharing can be unnecessarily hurtful. Strive to be kind and respectful while also being direct. Part of maintaining a group's trust is striking a balance between respecting confidentiality versus transparency. Before a critical meeting, check in with people you have discussed the issue with to ascertain their level of comfort in having information revealed. If you are a non-member preparing to facilitate a group, find out ahead what the culture of the group is regarding transparency. In some situations facilitators should acknowledge that it's not okay to tell the truth, and that it's okay to speak to that. Beware of a "victim mindset" in an individual that could enter the whole group into a victim perspective. Be aware about the dynamics of trust and honesty that are influencing the group. For example, an activist group that values transparency and has a shared commitment to truth, verses a business environment where speaking something unfavorable about the boss could result in very real negative ramifications. Sometimes fear of being honest is masked in some other way, often through disengagement. "I'm not going to participate in this, because I know what will happen"
A committee within a Cohousing project found itself in minimal communication with the rest of the community, resulting in a hazy mandate for the committee, and a lack of understanding within the community of where the committee was blocked. This led to increasing tensions within the committee and impatience at perceived lack of progress within the group. The transparency pattern was invoked through a fishbowl process: the committee met to discuss their blocks while the community sat in a wider circle and listened. This allowed the community to witness the dynamics of the committee, rather than treat it as a black box. The Formats list on Tree Bressen's website includes some formats that can offer full or partial anonymity: Multivoting, Shelter Scale, Card-Storming, Ranked Ballot, Anonymous Cards.